June 28, 2018 - Urbanisation is accelerating and creating pressure to increase housing construction. To answer this global challenge, construction needs to be quicker and more ecological. 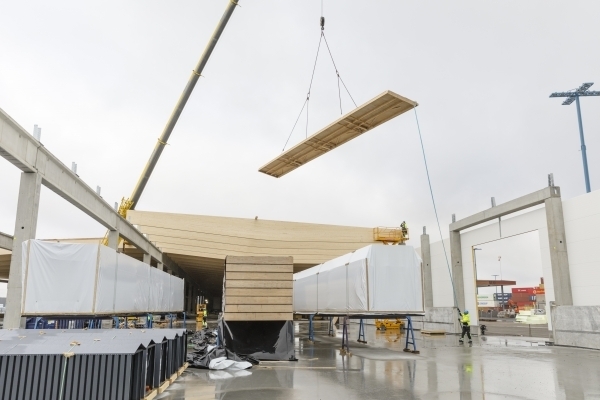 In Metsä Wood's new video, Mikko Saavalainen, senior vice-president of business development, and Juha Kasslin, vice-president of product management, explain what off-site wood construction has to offer. At the moment, construction produces 30 per cent of the world's carbon dioxide emissions, and it is clear that the course must be changed. We need more ecologically sustainable solutions. Wood is the only major construction material that stores carbon. Wood is a renewable material, and when the wooden parts are no longer used in buildings, they can be reused or recycled. Another key factor in urban construction is speed. The construction industry is undergoing a major transition, with construction moving from building sites to off-site manufacturing. Elements and modules are assembled in industrial factory conditions and delivered to building sites for quick installation. The lightness and strength properties of engineered wood products, like Kerto LVL (laminated veneer lumber), make off-site construction a very attractive option. Using prefabricated wooden elements significantly reduces time spent at the construction site. As most of the construction work is done indoors, there are no delays due to weather conditions. The turnaround time on building sites is shortened as the amount of errors is reduced and work safety is improved. Metsä Wood's cut-to-size Kerto LVL products and optimised element production ensure material efficiency with minimum waste. Kerto LVL products have an excellent strength-to-size ratio, which means less construction material is needed, and therefore traffic to the building site is minimised. Kerto LVL products make construction fast, light and green. Metsä Wood is actively building a partner network to increase off-site manufacturing of Kerto LVL elements for this purpose. "The Kerto LVL ecosystem means a network of companies with who we can together develop and grow the use of wood elements in construction," says Laura Mattila, vice-president of sales development at Metsä Wood. "The strength of the ecosystem is based on everybody concentrating on their core competence. The sum of this is more than each party trying to do everything by themselves." Metsä Wood's core competence is to produce Kerto LVL products on an industrial scale. Meanwhile, the element manufacturers carry out a lot of product development based on this versatile raw material. Are contractors doing enough to attract capital?